writing a book can be mentally stimulating and personally gratifying,there are millions of books being written each day, some of them are just stories floating around in a persons head waiting for the right off ramp to exit,some find that exit and some don’t they just remain on that perpetual round about, leading to that high way to no where. And for the stories that do find the off ramp and become books ,they face an up hill battle of finding some eye balls to curl up, in a warm cozy bed and read them.A little over one year ago this idea of,”its all coded in our birth date. ” entered into my head, which later became the mu-ji-man codes , began its journey from my thoughts and I was fortunate to direct it to the right off ramp to become a book today, with all its shortcomings, I am very proud of the fact that I had the courage to bring the idea to fruition and guide it off that round about in my head, where it could have remained and died a quiet death with no one being the wiser. Having said all that and giving myself a good pat on the back ,that was actually the easy part,now that the book is written and is in circulation the real work begins of finding those eye balls to snuggle up with,I do thank all of you who purchased the book and gave me your feed back. In my quest to make sure the world at least hears about the mu-ji-man codes theory ,I have dedicated myself to utilizing every tool available to me,so today I am announcing the launch of the Mu-ji-man codes on line magazine.the magazine will be published monthly for now and I hope to progress to a weekly as time permits,the main focus of the magazine will be to report on a specific famous dead celebrityfor that month,either recently dead or other wise , I will publish their individual mu-ji-man codes, such as their death age,coded age and other dates of major events in their lives.princess Diana will grace the cover of our first issue in December,2013.followed by whitney in January 2014. The magazine will be available for subscription as well as individual monthly purchase. From all of us here at the mu-ji-man codes we will like to wish every one a happy thanksgiving especially all the us forces around the world who are not able to be with their families on this day,God bless and stay safe.And for those at home enjoy that bird but lets not over do and lets remember all those outside our doors whom are homeless and hungry,make a pledge to share a plate with a homeless or less fortunate person on this day. God bless and have a mu-ji-man codes holiday. Well the truth is we all die a little each day and from my personal experience the fear of death prevents us from living a lot every day. 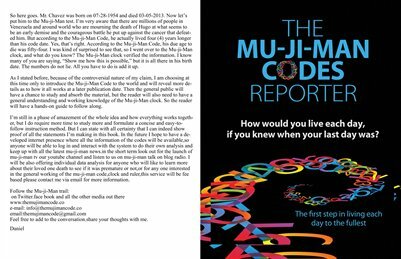 As was stated in the book the mu-ji-man codes the only ones who do not know when they will or are expected to die are those who do not want to know and the one whom are too scared to face the issue.on pages 13thru 17 in the mu-ji-man codes are charts of the life expectancy for every known country on planet earth,the numbers range from ages 39.6 for Swaziland to 82.6 for japan,the averages for women is higher,the average life expectancy for the united states is 78.2 for men its 75.6 and women 80.8. any entity involved in population management and control knows within a pretty good amount of certainty when their people or in some cases subjects will expire,there is no guess work involved when it comes to maximizing profits. A quick search on the internet for total life span and total expected heartbeats per billion per lifetime will produce a multitude of sources filled with grafts and charts and countless amounts of analytics for all areas of the human spectrum.for those of you who do not want to search on your own,as part of the mu-ji-man codes system I have created a mu-ji-man clock which is to the left on the page and it in conjunction with the mu-ji-man ruler provides all the information you will need to answer the question “when will I die”. In a future post I will be going into the inner workings of the clock and how any one can use it to determine when they will die,the clock shows you where you are in the wheel of life and how much longer you have to go before the end of the road. Know lets look at a quick example of how you can answer the question “when will I die”. Take a quick look at the mu-ji-man clock to the left ,the numbers on the very right represent the estimated number of heart beats per billion per lifetime,find your current age on the clock,those numbers are on the outer rim of the clock.now take your age and multiply it by 41,975,000 which is the est.average heartbeats per year and you will get your total current heart beats which is shown on the clock,now all you need is your mu-ji-man coded lifetime age as is written in your birth date and the next step will be to subtract your actual age from your coded age and you will see how much time you have left,just match it up on the clock and the clock will show you precisely in what month and season you can expect to die.i realize this may all seem a bit complicated but once you are familiar with the mu-ji-man codes it is actually quite simple and educational at the same time.Everyone can know the answer to the question “when will I die” by using the tools of the mu-ji-man codes and dedicating a few hours to figuring it out,contact me to learn your coded age and you can figure the rest from there.so I want to close by saying live like u know when your last is will be ,its all coded in your birth date. TODD WAS A FIVE TIME PRO BOWL TIGHT END AND TWO TIME SUPER BOWL CHAMPION AND SPENT MOST OF HIS NFL CAREER WITH THE LOS ANGELES AND OAKLAND RAIDERS. THE MU-JI-MAN CODES WILL LIKE TO WISH TODD GODS SPEED AS HE EMBARKS ON HIS NEW JOURNEY AND WE EXTEND OUR DEEPEST CONDOLENCES TO HIS FAMILY AND FRIENDS FOR HIS EARLY PASSING. BASED ON TODDS MU-JI-MAN CODES REVIEW,HE WAS CODED TO DIE AT THE AGE OF 67,SO BASED ON HIS DEATH AGE OF 57 HE DIED TEN YEARS SOONER THAN WAS CODED INTO HIS BIRTH DATE. THE MU-JI-MAN CODES WILL LIKE TO EXTEND CONDOLENCES TO THE FAMILY AND FRIENDS OF MS. MITHCHELL AND WISH HER GODS SPEED ON HER NEW JOURNEY,SHE WAS A VERY SUCCESSFUL ACTRESS IN HER LIFETIME AND PLAYED IN MANY SHOWS THAT BROUGHT JOY INTO THE LIVES OF MANY. 7 YEARS EARLIER THAN CODED ,BUT IN MY OPINION SHE DID PRETTY GOOD I DON’T THINK TOO MANY PEOPLE WILL COMPLAIN ABOUT ACHIEVING SUCH A NICE DEATH AGE ESPECIALLY IS SHE WAS HEALTHY AND ACTIVE , GOD BLESS. Hello everyone ,this past Monday was the debut of the mu-ji-man codes radio show on the blog talk radio network,I am very excited about the start of the show as it will allow me to express mysely in a manner that is vey natural for me and in ways I cannot always do via the written words.the next episode will air on Monday November 18th 2013 at 12.30 pm eastern time so you are all invited to join me live each week as I break down the mi-ji-man codes and engage in some other lively topics,I will always aim to talk about current but relevant topics. If for some reason you cannot join be live you can always catch up with the past episodes by visiting www.themujimancodes.com and click podcast you will see all the upcoming episodes as well as the past . the mu-ji-man codes will do a free basic reading for any veteran who request one all day veterans day and through Friday November 16th,2013. A few days ago I read an article on yahoo about the death of mr Yasser Arafat ,in this article his wife was trying to alert the world that her husband was indeed assinated as she and the rest of her inner circle had suspected all along.i admire her tenacity because she refused to give up and kept up her search for the true cause of her husbands death,she even had his body exumed so the necessary tests could be run on his remains,of course we will never know for sure who actually killed this man but at least it will be comforting to his wife and family to know the true cause of his death. In full disclosure my motive for doing this post is pure self serving and I also hope it will help to give the family and friends of mr. Arafat some comfort .for those of you who already read my book the mu-ji-man codes you will see that on page 40 of the book,the death of Yasser Arafat was one of the people I researched to establish the mu-ji-man codes theory,and in the book I mentioned that at the time I was writing that particular portion of the book his body was being exumed to see if he was taken out of the game of life before his due date and as I clearly stated in the book he was, and the conclusive evidence provided this week supports that. The above information is the same as written in my book the-mu-ji-man codes page 40. I believe that death is no accident and that there are forces both natural and man made that is constantly at work to bring about our demise or destiny if you want to call it that. If the idea of the mu-ji-man codes ,its all coded in our birth date is correct where by all our major life and death occurences is pre programmed into our birth date pretty much like so much info is programmed in ou rDNA ,then it wont be a stretch to imagine that pre programming all the details of our demise is mother natures way of being efficient and having everything on auto pilot to keep the cycleof birth and re birth in harmony. So in closing how shall we look at events like mr arafats death and countless others like him who has been taken out of the cycle of life by the man made forces at play in our society, is such a force also one of natures tools she utilizes so efficiently in carrying out her plan for keeping all things in balance, no different from diseases such as cancer,diabetes,heart attacks,strokes,accidents,and the list is endless,or should we look at such meddling by man into the affairs of mother nature as she goes about her duties ,as yet another example of us (humans) disrupting the delicate balance of nature and causing much harm as we so foolishly do to the environment. on behalf of the entire mu-ji-man codes team,I will like to extend condolences to the entire nation of the phillipines for the destruction and deaths caused by typhoon haiyan. I encourage all our readers to do what ever is within your means to help the people of the devasted areas by contacting anyone of the many relief organizations such as the red cross to make a donation. No amount of words can describe the full descruction of the storm and the misery the local population will have to endure as a result ,so lets all keep the victims of this mega typhoon in our thoughts and prayers. know it ,maintain it ,track it . knowing your vital numbers such as your bp,chl,heart rates,sugar level,etc is the responsibility of every human being and once you know these numbers its your job to maintain them and forever track them for the rest of your life,the mujiman ruler is designed to help you in this area by providing you a very simple easy to use tool to remind you daily of your important numbers,the ruler is most efficient in tracking your heart beats per billion and shows you where you are on the wheel of life. I have heard from many of the readers of my book the mu-ji-man codes that they just glanced over the photos of the mu-ji-man ruler and the mu-ji-man clock because the photos were not in color and was too complicated to understand so they chose to ignore them and kept on reading,so if you will indulge me I will like to spend this post explaining the mu-ji-man codes ruler and ruler and will cover the clock in a future post. To the top right of that are the estimated total heart beats ranging from sec to year I. e. 1.33 beats per sec to 41,975,000 per year on average. To the right of that is a blank space to outline your goals. Looking at the ruler it is an actual measurer for determing how much of your allotted heart beats you have already utilized and how much u may have left.,so as always I encourage to to check it out for yourself and use the data from a deceased loved one to see how they did . Once again for those of you needing more details and analysis feel free to contact me for a personal reading. 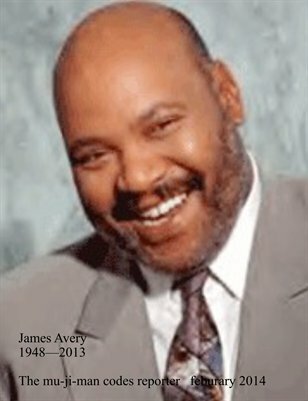 The mu-ji-man codes will like to extend condolences to the family,friends and co workers of tsa agent Geraldo I Hernandez,fatally shop on Friday while performing his duties at the lax airport by suspect Paul Ciancia.Our heart also go out to all the others injured by this senseless shooting. At this time we do not have enough information to conduct a mu-ji-man code analysis on the deceased to determine if he lived to his due age but as that information becomes available we will follow up and report back.whenever some one dies there is always the question Why?for example with all the thousands of people at the airport on Friday why only this particular individual lost his life,the one person that wanted to die on that day (the shooter)was shot but some how survived so again we have to ask is it faith or is it mr death just performing his duty,if it is mr death at work ,he sure is vivious in his approach to claim the soul of just one person,we see the same pattern over and over again,in the countless number of train wrecks,car accidents,plane crashes etc.where everyone else survive and only one or two people will die from the group as the others are left terrified as they come face to face with mr. death himself. So as we try to make sense of this and every other death ,I encourage all the readers to read the-mu-ji-man codes the book to get a better insight on how you can learn about all the information embedded into your birth date and to take the time to know your coded age.